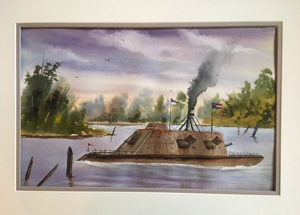 "The Escape of Captain Tombs"
Mark has donated his painting "The Escape of Captain Tombs" to the CCCS to be auctioned at our 2018 Charleston Convention at the Saturday night banquet dinner. All proceeds will go to the CCCS to help fund the event. This 15"x22" un-matted watercolor painting is entitled "The Escape of Captain Tombs". The artist's interpretation is based on the description of the ironclad featured in the Cussler novel "Sahara." It depicts the ship, commanded by Captain Mason Tombs fleeing from Union forces after the kidnapping of its famous passenger. The real CSS Texas was never placed into service by the Confederate Navy and was captured by Union forces while still undergoing fitting shortly after the fall of Richmond. 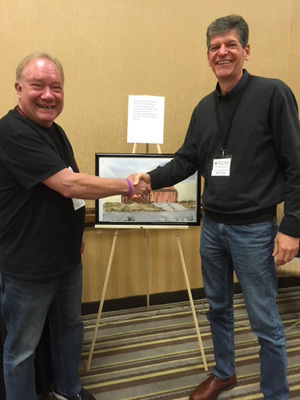 At our 2017 CCCS Denver Convention, Mark donated his painting "The Hangar" and was auctioned at the Saturday AM meeting. All proceeds were used to help fund the event. 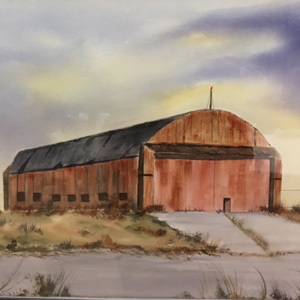 The Hangar painting is based on the description of Dirk Pitt's hangar at National Airport (now Reagan) in the book "Dirk Pitt Revealed" by Clive Cussler. A fierce bidding war between Barry Campbell and Dirk Cussler ensued, with Dirk ending up with the top bid. Mark Adcock was raised in Kansas City, Missouri and attended Northwest Missouri State University and graduate school at California State University, Fullerton. His painting began in earnest following his retirement after 40 years of public service as a police officer and city manager. A member of the Watercolor Society of Oregon, Mark's paintings have been included in juried art shows on the Oregon Coast and are shown in several restaurants and galleries on the Oregon Coast, as well as commissioned paintings in private collections on both coasts and the midwest. Mark, wife Robin and basset hound Deuce reside in Waldport where Mark enjoys the beauty of the Oregon Coast as subject for many of his paintings. Mark's most significant influences in watercolor painting include renown Oregon Coast artist, John Bradley, as well as world acclaimed English watercolorists, Ron Ranson, Edward Wesson and Edward Seago.